Sword Master Masaki Yamakoshi-sensei (山越正樹) is 20th grand master of Muso Jikiden Eishin-ryu Yamauchi Style (無双直伝英信流山内派). 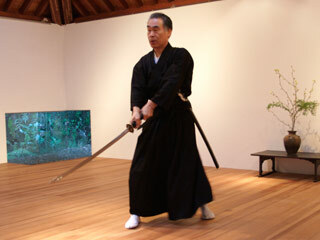 He had started “居合道, Iaido” (the sword fighting) when he was 17. Since then, he has over 43 years of experience. Even after the master degree of the sword style, he still pursues the truth of real sword fighting which he had succeeded from his teacher. Because he stays on the right line of traditional sword fighting from this style, his skills and technique are exactly the same as the old traditional sword fighting style. More over, he also teaches and practices to make his sword skill better and more practical. “The sword fighting is the art, it has to be beautiful.” said Yamakoshi-sensei. Muso Jikiden Eishin-ryu is one of the two major sword styles today in Japan. It was found by Jinsuke Hayashizaki (1548 - ?) and mainly succeeded by Tosa (Kochi prefecture) people. The students of Toyotake Yamauchi (山内豊建), the 18th grand master, are called Yamauchi style, and Yamakoshi-sensei is one of those. Yamakoshi-sensei of teaching style is based on the traditional way of Muso Jikiden Eishin-ryu, which start from Kata, the form, then teaches secrets and logic for applying all Kata to make them real and practical. “Our sword style is not teaching how to use sword for killing weapon, but using sword to survive from the sword fighting situation.” By Yamakoshi-sensei. So, the most important principal of his sword fighting and lesson is to survive. Muso Jikiden Eishin-ryu (無双直伝英信流) is a classic sword art, and one of the most widely practiced schools of Iaido in the would. It was founded by Jnsuke Hayashizaki, but the name was taken after Eishin Hasegawa (長谷川英信). Hayashizaki Jinsuke Minamoto no Shigenobu (林崎甚助源重信) lived in 1546 to 1621?. Many of the historical details of Hayashizai’s life are suspect, since, like most famous sword masters in Japan. It seems that he grew up durng a time of constant warfrea in Japan and was exposed to various sword-fighing methods from an early age. According to legend, Hayashizaki’s father was killed, and in order to take revenge he began training in earnest. He went to the Hayashizaki Meijin Shrine to pray for guidance, and received divine inspiration for a new technique of drawing the sword and attaking in one movement. Legend says that he eventually defeated his father’s killer. The seventh generation soke of Hayashizaki’s school, Hasegawa Chikaranosuke Hidenobu (Eishin), was one of its most important headmasters. He had a major influence on the school. In particular, he adapted techniques originally developed for the tachi to use the contemporary sword. He also devised many new techniques, some of which now form the Tatehiza no bu set. Hasegawa’s influence and adaptation led to the style being named Hasegawa Eishin-ryū. It was also referred to as Hasegawa-ryū or simply Eishin-ryū. Some regard Hasegawa as the primary founder of Eishin-ryū, which would make him the first generation sōke rather than the seventh, and make Shinmei Musō-ryū a parent school of Musō Jikiden Eishin-ryū. Toyotake Yamauchi (山内豊健) is the 18th grand master of Muso Jikiden Eishin-ryu, and his style is called Yamauchi-style. He lived 1903 to 1946. He had learned Yagushinkage-ryu (柳生新陰流) and because Yamauchi family was the land master of Tosa, he had also learned Muso Jikiden Eishin-ryu. One of the greatest sword master in 20th century.